What is a livable community? How do you design and develop one? What does government at all levels need to do to support and nurture the cause of livable communities? 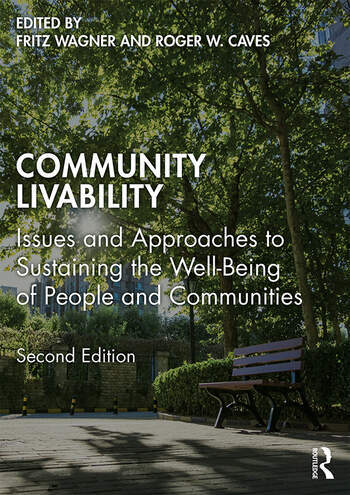 Using a blend of theory and practice, the second edition of Community Livability addresses evidence from international, state and local perspectives to explore what is meant by the term "livable communities." The second edition contains new chapters from leading academics and practitioners that examine the various factors that constitute a livable community (e.g., the influence and importance of transportation options/alternatives to the elderly, the importance of walkability as a factor in developing a livable and healthy community, the importance of good open space providing for human activity and health, restorative benefits, etc., the importance of coordinated land use and transportation planning), and the relationship between livability and quality of life. A number of chapters focus on livable communities with case studies from an international perspective in USA, Canada, Australia, Peru, Sweden, South Korea, Japan, and Austria. 12 Las Lomas Colonia in Texas: A Livable Community? Fritz Wagner has a doctorate in Urban and Regional Planning from the University of Washington. On completion of his degree he moved to New Orleans where he joined the University of New Orleans. During his 28 year tenure at the University of New Orleans, he served for 20 years as Dean/Director of the College of Urban and Public Affairs. In 2002, he joined the Department of Urban Design and Planning at the University of Washington. Roger W. Caves is Professor Emeritus of City Planning, School of Public Affairs, San Diego State University. He received his doctorate in Urban Affairs and Public Policy from the University of Delaware in 1982. He has authored and edited many planning volumes including Exploring Urban America: An Introductory Reader (1995) and Livable Cities from a Global Perspective (2018) with Fritz Wagner. His research areas include urban planning, direct democracy, smart cities, housing and information technology, and community development.